Today is the last day of CAS-ual Friday Stamps sneak peek sets. The last new set featured is called Countdown. 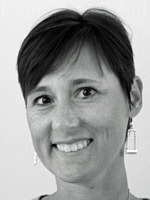 A special thanks to Michele Gross for letting me play along. I had a blast designing with those fun new stamps!!! 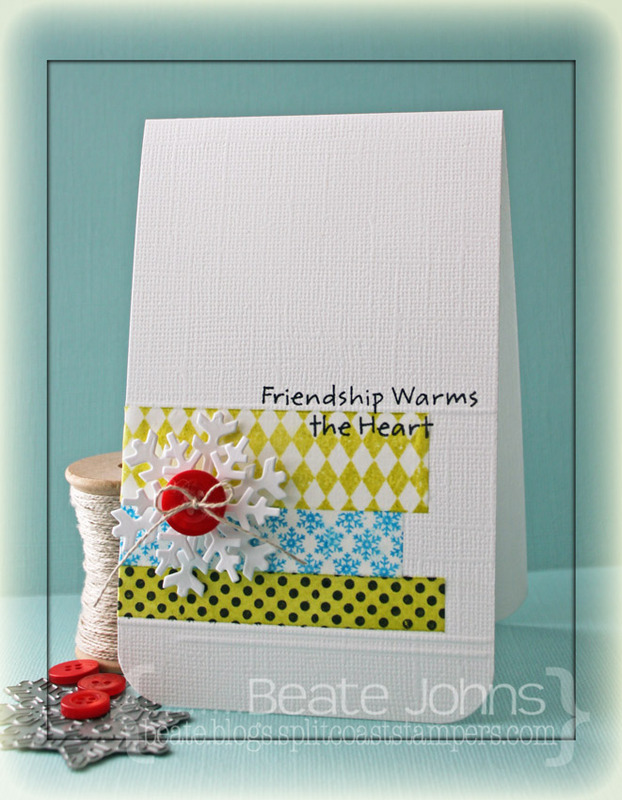 I created this card on Sunday for the Featured Stamper Challenge on Splitcoaststampers. I picked this card to case. Obviously I didn’t read the description, because only after being done with my card I saw that the featured stamper didn’t create this card, but received it through a swap. Oh well… I love the wavy line of the snowflakes and wanted to re-create that with the acrylic stamps. 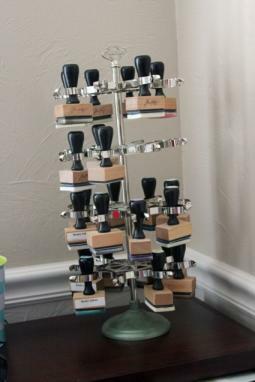 I love that about clear stamps. I lined up the strip with the ovals on my acrylic block first, then added the countdown strip underneath. Both were inked with Tuxedo Black Memento Ink and stamped on a 3″ x 5″ piece of Neenah Solar White cardstock. Next I filled in the ovals with the solid oval stamp and Sea Breeze VersaMagic ink and the striped ones with Aquatic Splash Versamagic. The upper left and lower right corner were rounded and layered on a piece of black cardstock, that was 1/8″ bigger. The card base is a 7″ x 5 1/2″ piece of Patina Bazzill Cardstock, folded in half. Again the corners were rounded and little adhesive silver pearls were added. A sentiment from the strip was stamped on a 1/2″ wide strip of white cardstock. The left side was cut and a button was tied on with silver cord on the right. The sentiment was adhered to the lower right side with foam adhesive squares. 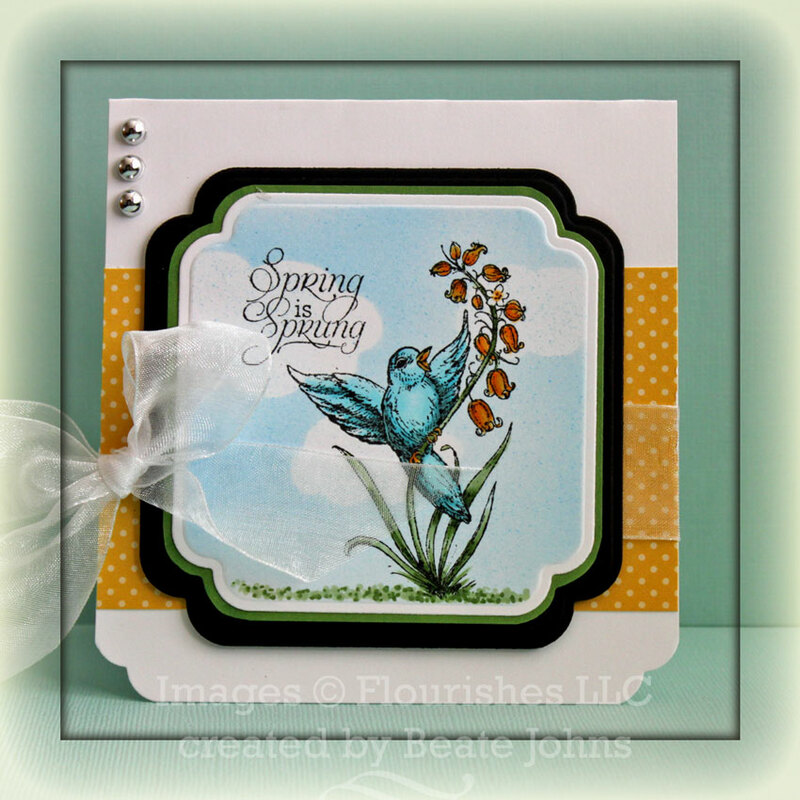 I created this card a while back for a Featured Stamper Challenge at Splitcoaststampers. The featured stamper that day was Tenia Sanders-Nelson. She has an amazing gallery of CAS cards. While those are not easy to make for me, I gave it a whirl. I picked Tenia’s Trick or Treat card and used Winter images from Lawn Fawn’s Cute Critters in the Snow. I cut and embossed three circles out of Neenah Solar cardstock with Classic Circle Nestabilities dies. The small penguin image was stamped in each center with Tuxedo Black Memento Ink and colored with Copic Markers (Y15, Y17, YR15, C0, C1, C3, C5, C7, BG10, BG11). Glitter was added underneath each Penguin. The card base is a 6″ x 6″ piece of Kraft cardstock folded in half. 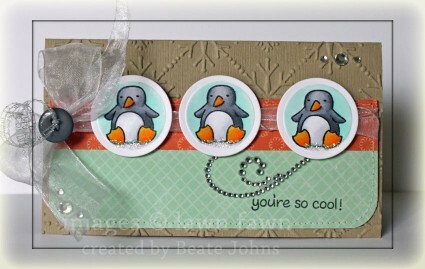 The card front was embossed with a Snowflake Embossing folder from Sizzix. A 3/4″ x 5 3/4″ piece of Echo Park Walk in the Park was stitched to a 1 1/2″ x 5 3/4″ piece of Echo Park Holly Jolly Christmas cardstock, after the bottom corners were rounded. Before the layers were adhered to the card base, May Arts Organdy Ribbon was tied around the paper strips. The ribbon was topped with a Basic Grey Button tied on with May Arts Silver Curling Ribbon. The images were adhered over the ribbon with dimensionals. Silver Rhinestones and part of a Finesse Rhinestone Swirls finish off the card front. 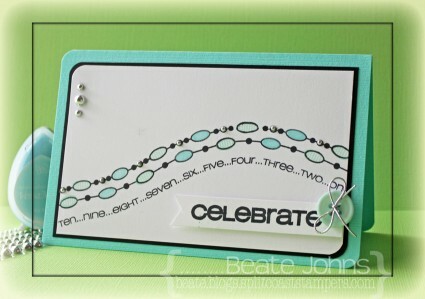 I created this card for yesterday’s Featured stamper Challenge on Splitcoast. Saturday my latest order of Flourishes stamps, the new release, arrived and I couldn’t wait to try them out. So I picked this card from Mary Beth. It is a CAS card, and I usually have a hard time with them. Casing a card helps, but still I had to add a bit of patterned paper, just a few pearls and some ribbon. I stamped an image from Flourishes Spring has Sprung in Tuxedo Black Memento ink on Neenah Solar White cardstock, cut and embossed it with a Label 13 Nestabilities die and colored it with Copic Markers (BG000, BG01, BG72, Y21, Y38, G21, G24, G28). Cloud masks cut with the Cloud Die-namics die out of Tim Holtz Mask Sheets were adhered over the image and it was airbrushed with Copic Marker B12. I took the masks and carefully airbrushed a bit more with the brush side of Copic B12 to add a few speckles. The image was adhered to a piece of Celery cardstock that was hand cut to a slightly bigger layer. The edges of the paper were colored with Copic Marker G24 to match the image. Both layers were adhered to a piece of black cardstock, cut and embossed with the next size label12 die. The card base is a 4 1/4″ x 9″ piece of Neenah Solar White cardstock folded half. The lower corners were rounded with a decorative corner chomper, to match the edges of the Label die. A 2 1/2″ x 4 1/4″ strip of October Afternoon Modern Homemaker paper was adhered to the card base and White Organza ribbon was tied around it. The image was adhered to the card with dimensionals. Silver Recollection Pearls on the top left of the card finish off the card.